Thank you Andrea of Scraptastic Saturday , Thank you Sinea of Wonderful Wedenesday, Thank you Karen of Friday Feature, Thank you Andrea of A Morning Cup Of Joe for the feature of my Food For The Gods. Humba is an interesting dish. 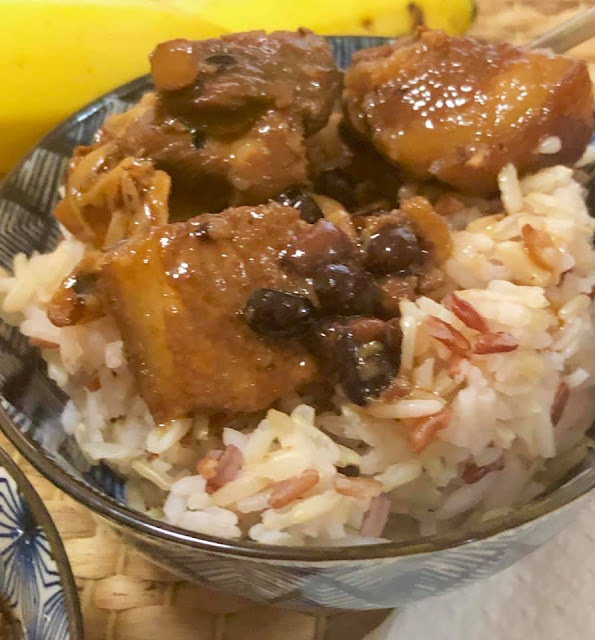 This slow braised pork (could be pork belly, pork ribs or both) is cooked in a sweet glaze of sugar (panocha/palm sugar during the old days) and given depth of flavor with the addition of soy sauce, salted black beans, and star anise. Although this dish finds its local roots in the Visayas part of the Philippines just by casually perusing the ingredients listed below, it is clear that this “local” dish has origins beyond our own shores. It is clearly related to Adobo Recipe which is handed down to us by the Spaniards.The Chinese settlers came which introduced to us the braising method of cooking and therefore a fusion recipe was created by the Filipinos in Visayas area. I read that a woman was the author of this recipe. 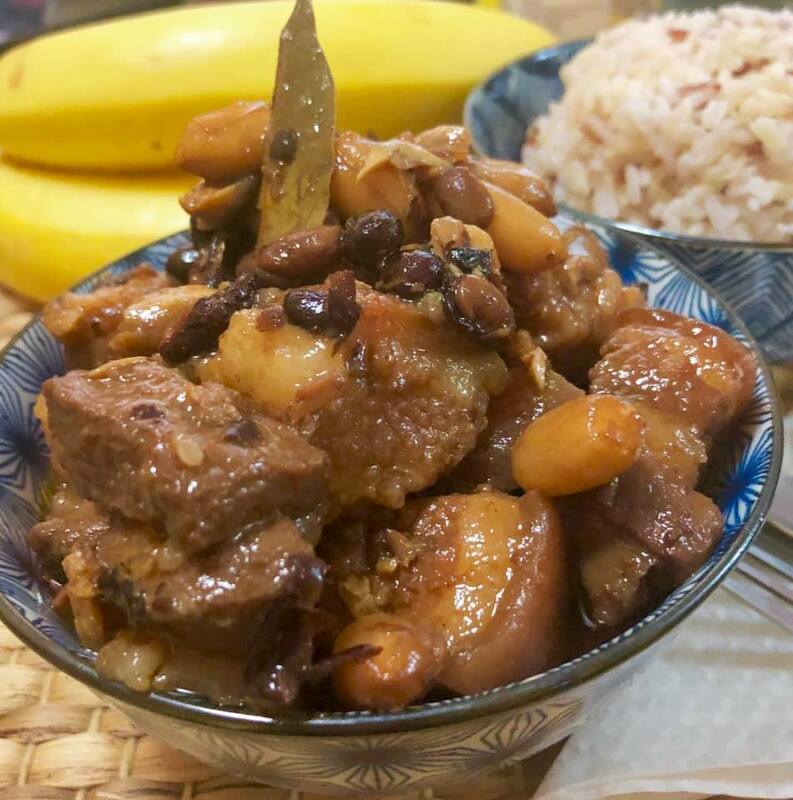 Humba is an adobo recipe with a twist of Chinese braise. The difference between Chinese Braise and Filipino Braise is that ours has thick sauce that coats the meat as well with a very strong flavor combination of salty,sweet and sour. The thrill of it is that it does not spoil at once,the shelf life is longer even for weeks. I remember my Uncle who would cooked Humba every time we had a family affair. Humba would usually consist of all the fatty parts and unwanted parts of slaughtered pig. Going home after the event, we have a garapon or jar of Humba with us. Personally, I am thrilled about this discovery because the magic of good food really goes a long long way. Most Asian culinary cultures have a version of braised pork, sweetened by sugar and balanced by a savory counterpoint of soy sauce, rice wine or even fish sauce. Even within every Filipino household, the preparation of this simple Humba varies greatly. Besides the usual addition and subtraction of ingredients, some recipes recommend the use of pig trotters instead of the more common pork belly. Adding to complexity of this dish, other recipes even suggest adding mushrooms, banana blossoms, rice wine, hard-boiled eggs and even potatoes into the mix. 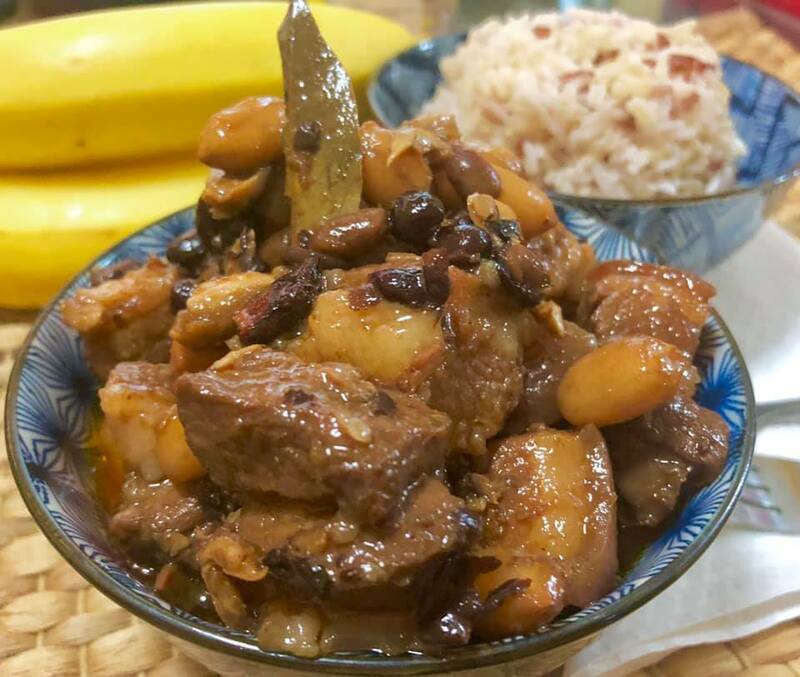 But Id rather keep my Humba relatively simple–cooking a tried-and-true family recipe but of course with some slight changes. And Yes! the most interesting part is ..I love Humba with Fried Banana slices on top. In a bowl, combine these ingredients: meat, garlic, vinegar, brown sugar, soy sauce and rice wine. Marinate for about 30 minutes. Set aside in the fridge. After 30 minutes, transfer to a sauce pan and add: water, black beans and peanuts. Cover and bring to a boil, once its boils, turn the heat to a simmering mode and add the rest of the ingredients: bay leaf, star anise, oregano, paprika and olive oil. Here...its ready, the meat is tender, the characteristic of taste is..as usual..a chaos between sweet, salty and sour.. lol! but thats how we enjoy our food. 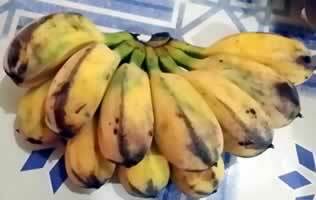 I love pork and I love fried bananas. This looks incredible! Thanks for sharing at the What's for Dinner party. Hope the rest of your week is amazing! 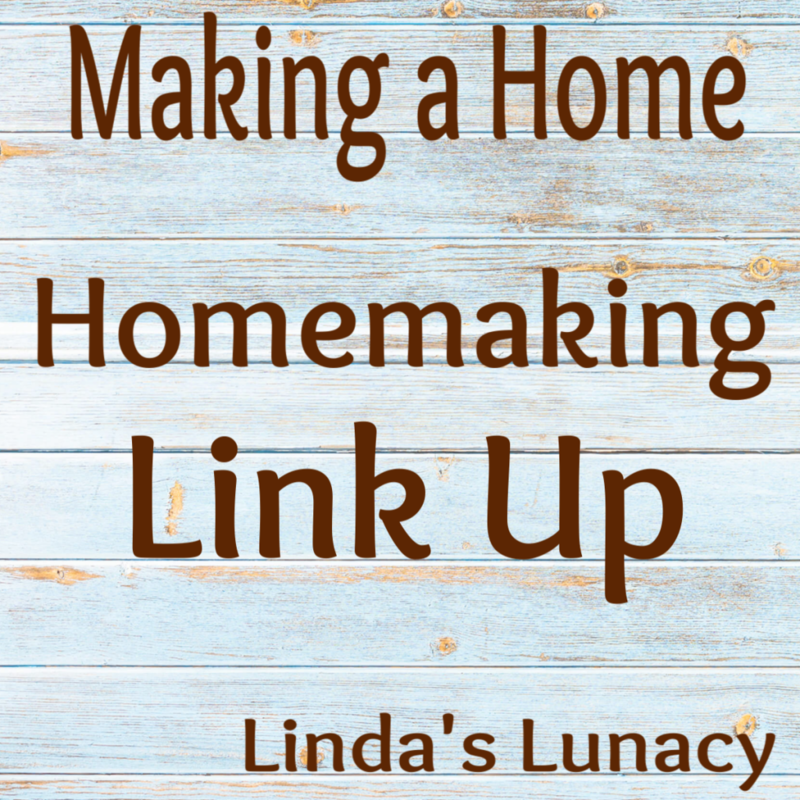 Thank you Helen and likewise thank you for featuring it this week. Have a lovely weekend. It really is delicious Chas ! Thank you for coming over and have a great weekend. This dish looks so good and thanks for sharing the recipe at Cooking and Crafting with J & J! Thank you Julie, its my pleasure. Have a lovely weekend. Thank you Claire, its my pleasure. Have a lovely weekend. I see that this is close to adobo, except that this has way more ingredients. I am not eating pork, but I am sure I could use chicken. :D Thank you for sharing at Fiesta Friday party! Yes Jhuls, its like Adobo and the shelf life is longer too and the more it taste good after a couple of days. And youre right, chicken is also great. Thank you for coming over and have a great weekend. That looks so good. #Alittlebitofeverything.